The award-winning, death-cheating director of “Grizzly Man” and “Fitzcarraldo” gets up close and personal for his latest documentary. He talks to Fast Company about the lessons in creativity he learned from his time with a multiple killer. Nearly every Werner Herzog movie has at least one Holy Crap moment, and the filmmaker’s gripping new death row documentary Into the Abyss, opening today in select theaters, is no exception. Interviewing Texan triple-murderer Michael Perry, a former executioner, and members of the victims’ families, Herzog elicits shattering revelations from each subject. Into the Abyss, opening Friday, represents the latest in a stream of scripted features, non-fiction films, and TV shorts that address an astonishing range of subjects. Unlike most Hollywood directors who devote two or three years to a single movie, this German-born auteur churns out edgy, well-crafted projects–57 and counting–with relentless efficiency. It’s hardly because he takes the path of least resistance. 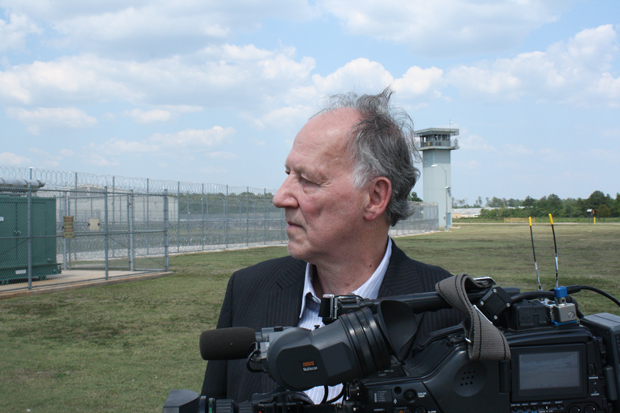 Herzog moved to a remote Bavarian village at the age of three after his neighbor’s house was bombed by Allied planes, and he’s been thriving on adversity ever since. His urge to capture “ecstatic truth” continues to fuel a body of work informed by obsessive characters, grueling quests, and hair-raising locations. To make the 1982 disaster-fest Fitzcarraldo, Herzog spent months in the Amazon jungle fighting bugs, money-drained producers, and tantrum-throwing star Klaus Kinski, too. For a scene in which local people were supposed to carry a 320-ton steamship over a mountain, he hired locals to … carry a a 320-ton steamship over a mountain. Case in point: After reading a New Yorker article about pre-historic drawings discovered in French caves, Herzog devised special 3-D cameras, then coaxed rare access to the Chauvet caves from cautious officials, lowered himself through a 10-foot drop into the cavern, and came out the other end with jaw-dropping images of 20,000-year-old drawings featured in last year’s Cave of Forgotten Dreams. For Grizzly Man, Herzog transformed 85 hours of camcorder footage recorded by wilderness lover Timothy Treadwell into a disturbing man-versus-nature rumination. The 2005 documentary culminates when Herzog films himself listening through headphones to audio recordings of Treadwell and his companion as they get devoured by bears. Herzog’s readiness to go deep extends to his scripted dramas, which routinely attract some of Hollywood’s most intense actors. Nic Cage delivered an out-of-orbit performance as a coked-up detective in The Bad Lieutenant: Port of Call–New Orleans. Christian Bale lost 60 pounds and roughed it in the Thailand rainforest to play an emaciated POW in Breaking Dawn. For Herzog’s true-crime thriller My Son, My So, What Have Ye Done? Oscar-nominated Michael Shannon (Revolutionary Road) portrayed a character who slays his mother with a sword. None of these movies made much money, but Herzog, who often functions as writer, producer, narrator, cinematographer, music supervisor, and editor on his films, has figured out how to bypass the “you’re only as good as your last hit” box office mentality that drives most studio-centric filmmaking.